The Re-Animation of Khan may only be four minutes and fifty three seconds long but it took just over four months to get the script out of my head and into a completed animation. It truly was the script that was the stumbling point as this animation features only one custom prop that was specifically made for it (the GoAnimate screen shot). Everything else is 'straight off the shelf'. Before I go into to detail of what went on behind the scenes please watch the final animation below. The Re-Animation of Khan originally began as the third installment of my original series, How to Get Views - The Evil Genius Way. Khan was the ideal 'Evil Genius' since his back story from the nineteen sixties TV show placed his origin firmly in twenty and twenty first centuries - hence he just may of heard of GoAnimate (well, you never know... could happen!). So sure was I that this would be the third installment I even made an announcement on twitter on June 8 of this year. Not being a Star Trek fan and only having seen the movie, The Wrath of Khan, once when I was about eleven (maybe), I had to do some research to find out Khan's origin in the TV show. I did that because GoAnimate's Quog Character for Khan is based on the TV show version of the character and not the later, much cooler looking version, from the movie. Hence the back story Spock reveals in my animation is the true back story for Khan. Even the year 2267 is accurate for when Khan was revived by the crew of the Enterprise. So the animation began as a parody of the TV show in which Khan first appears. Obviously the GoAnimate element of the story and Khan's pursuit of fans comes from my Evil Genius series. By the 11th of June I had about everything complete up to the point where Khan escapes and then a bunch of half done ideas for scenes after that. Not only that but I still didn't have a punchline - which was needed to match the format of the Evil Genius series. The animation was already well over the one minute mark of the previous two in the series and I wasn't prepared to release something that just didn't live up to those animations. For the first time ever I decided to consult someone else on one of my animation scripts. RoTV is one of the many people on GoAnimate who are real Star Trek fans and came to the site through the Star Trek Quogs theme. He's made some of the best and most innovative Star Trek animations on the site but, more importantly for me, he's pretty good at comedy too. Which is why I sought his help on June 11th. To date RoTV is the only person who's ever seen one of my unfinished animations (and he may even be able to recall a scene or two that I deleted by the final cut). Whilst there probably isn't a lot of RoTV's suggestions in the final cut he did feed me a lot of information about the particular episode of the TV show I was trying to parody (but had never seen) and reminded me of a few elements in the Khan movie that I had forgotten. All of it was very useful in helping me advance the script. Unfortunately Ro didn't have any suggestions for a final punchline either. This became the real hurdle and is the reason why this animation took so long to develop. Several animations and two and a half months later (plus one fatal computer crash to recover from) I decided to try and finish this animation once and for all. The first decision I made was to remove it from the Evil Genius Series. It was already way off format and far too long. However it wasn't until the day before I made the animation public that I came up with the new title, The Re-Animation of Khan. A kind of play on the Khan movie title. 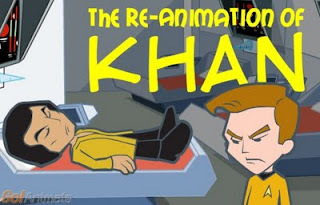 The first draft (if you can call the way I script a draft) was that Khan would try to get more views of his animations by broadcasting them on the ships viewing screens, however he would be discovered when he accidentally invokes a new GoAnimate feature and broadcasts a live feed of him and Nurse Chapel to the bridge of the Enterprise. A chase would ensue and... well I don't know where I was going with that? In the next version, Khan and Nurse Chapel take over the bridge of the Enterprise with the intention of broadcasting an animation across the galaxy. Kirk willfully submits to Khan's use of the bridge because he has a plan... don't know where I was going with that either. Third version, Khan captures Kirk and holds him hostage in the Engine room (much like in the TV show). He then communicates up to the bridge his demands to take over the ship. Spock takes his demands on board but contemplates the success of the show if Captain Kirk died in this episode (Khan appeared in the first season of Star Trek). An argument with the crew ensues as they worry about their future careers on the convention circuit... umm... yeah... not sure where that was headed either. The final script evolved as I just let the characters play the story out, all the while thinking 'Can I end this yet?!'. Everything up to Khan's animation is almost exactly as I created it right from the beginning. It all started heading a new direction when I realized, wouldn't it be funny if Kirk was faking that he knew nothing about GoAnimate? Thanks to GoAnimator, Coady, as well as a few others, GoAnimate has been a very popular place for William Shatner's other creative pursuits. What if it was Captain Kirk, himself, that was posting all those animations? Plus, there is a great ongoing story here for Khan being Kirk's arch nemesis in popularity on GoAnimate. Next up, I liked the idea of Kirk being held hostage in the engine room. Originally I had Doctor McCoy chasing Khan and Nurse Chapel down the hall but I quickly replaced him with Kirk. I got to the point of Khan relaying his demands to the bridge and suddenly remembered my first original Star Trek Quogs series, Laundry Day. This was the ideal opportunity to self reference my previous series hence Uhura's statement, "Let him kill the pompous twit!" (it was at this point that the Laundry day premise and the washing machine was added into this episodes opening premise - making it a kind of continuation of that story). I also like the idea of Spock contemplating the show without Kirk so managed to work that in without the objections from the crew as Kirk was able to cut this short with his line "I can still hear you, you know!" At this point I knew if Khan actually made it to his ship the animation may never end so I was searching for ways to make sure he didn't. First I thought, what if Nurse Chapel came to her senses and, when they got to the transporter room, she set the controls so that only Khan got beamed back to his ship? Seemed like a plan - so that's what I went with... except Kirk had demanded the crew to come and save him? Right. Spock's in charge so he should come up with a plan. It occurred to me that much of the Enterprise's control systems must be configurable from the bridge. I don't know if they are but for the purpose of my animation I made it so. However, for a little more comedy I thought it would be cool to have Spock formulating a plan whilst the rest of the crew jumped straight into action. Which worked out great because Khan could be outnumbered instead of having time to find some other way to get back to his ship. It also made sense that the stale mate between Khan and Spock would be enough to make Khan back down - since he was already in one stale mate situation between him pointing a gun at Kirk and the crew all pointing guns at him. Khan backing down wasn't the right point to end it all. There was still the unresolved issue of Kirk being outed as GoAnimate legend. I swear he'll deny his popularity on a 'kids site' until he dies! So that's the epic story behind The Re-Animation of Khan. Possibly one of the most difficult scripts I've put together to date!